Marpak was founded in 2003 with its partner OMS, of Arona, who has been a leading company in the packaging sector for years, nationally and internationally. The company is in continuous evolution, with a young team composed of highly qualified individuals. Marpak builds machines and complete packaging lines, in strict fulfilment of customer requirements, to create a product that satisfies their needs, starting from the design phase all the way up to the complete construction of the machines and installation at the customer premises. For this the company employs specialised staff, to satisfy even the most demanding customers. Marpak guarantees its customers a technical assistance service for the machines it produces, as well as the OMS brand, proposing scheduled maintenance throughout the year and periodic overhauls, even during company downtime to avoid slowing down production. 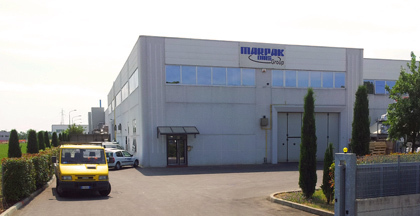 Marpak's customers can rely on a warehouse stocked with spare parts for Marpak and OMS machines, and on an assistance service provided by the sales department that is able to advise and guide the customer in an on-going manner. Marpak is the only company recognised and authorised to sell OMS brand spare parts and perform maintenance on their machines.